6th February - 16th February 1997. The Ground Floor Gallery, The Economist Plaza, St. James's Street, London W1, England. Buyers Exhibition: Lichfield Studios, 133 Oxford Gardens, London W10 on 30th January - 3rd February. Private View: The Royal College of Art, Kensington Gore, London SW7 on 21st January. Auction: Saatchi Gallery, 98A Boundary Road, London NW8 0RH on 4th February 1997. This exhibition of artworks were made by musicians on behalf of the War Child Charity. All the pieces were linked by a common theme referring back to a musician or band, who was their inspiration. In total twenty three participating musicians created a piece of work for this event around the person who represents for them, a musical 'milestone'. Besides Bowie, other artists included Bono, Yoko Ono, Bryan Ferry, Kate Bush, Lou Reed and Paul McCartney. David's 'Milestone' contribution was entitled 'The Walker Brothers Triptych'. 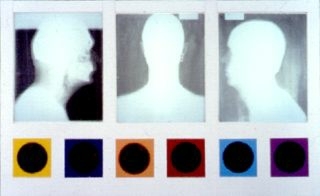 Consisting of Formica, X-rays and photographs with light installation, signed on the reverse "David Bowie '96. Artists' credits were Dr. Mitch Cassel, Dr. Frank Colenda, Reeves Gabrels and Tony Oursler. Lot No. 16 at the auction. You can still visit the Milestones Interactive Gallery and view all the artists' work. 5th August - 11th October 1997. The Model Modern Art Gallery 1934, Pallant House, 9 North Pallant, Chichester, Sussex, England. Tel: 01243 774557. David Bowie in Pallant House Peep Show: The Model Modern Art Gallery (1934) was the brain child of Sidney Burney, a progressive but sadly forgotten gallery owner who mounted excellent exhibitions in the 1930s. Burney asked leading artists of the day to produce tiny works for a miniature model gallery - a "doll's house", sized 6 x 6 foot. Go along to Chichester's Pallant House and peek at this rare microcosm of modern English painting and sculpture with works with Barbara Hepworth, Vanessa Bell, Duncan Grant, Henry Moore and many others. Burney's idea has been brought bang up to date with some of today's leading artists, including David Bowie, Beryl Cook and Anthony Green, showing small works (max 8 ins x 8 ins) alongside the Model Gallery. David's contributed art exhibit was entitled 'Monking'. 4th - 8th December 1996. The Henry Moore Gallery, The Royal College of Art, Kensington Gore, London SW7, England. Tel: 0181 742 1611. Exhibition sponsored by Absolut Vodka was to raise funds for the Fine Art Student Fund. The exhibition consisted of 1,400 original postcard sized paintings and drawings produced by the famous and also the students. The pieces were sold on a first come first served basis for £30 each. The twist to the art sale was that none of the artists were revealed until after the sale. Bowie entered four pieces: British Conflicts Series: No. 7 Military Man, Hand & Leg, Hallo Dolly and an ink sketch of Julian Schnabel. 27th November - 10th December 1996. St. John Restaurant, Clerkenwell, London EC1, England. David contributed artwork to the Jibby Beane charity fund-raiser the 'Looking Glass Project' and in conjunction with Davide de Angelis from Denovo, created five computer generated images. These images were projected on to a huge screen on the front of the building at 66 St. John Street, London EC1, where the public could dial up a local phone number and manipulate the images over the telephone. 7th November - 1st December 1996. The Royal Festival Hall, London, England. Plain white masks were sent out to over 1,000 public figures to be painted and then sold to raise monies for the Prince's Trust Fund. Just over 500 were returned for the charity auction. Mask number 56 was designed by David which consisted of a simple 666 stencilled onto the forehead and written on the reverse "Your pretty face is going to hell, Bo '96". The mask was arranged in a wicker basket, along with a brass plaque that read: "Hell Or Bust. David Bowie 1996." The masks were sold by postal or public auction on 28th November, David's mask raised a sum of £1,200. 31st May - 2nd June 1996. The Nash Room, Institute Of Contemporary Arts, London, England. David was invited to construct an installation for the Institute Of Contemporary Arts, who were holding a 3-day multimedia conference exploring the legacy of Jean Genet and Antonin Artaud. The installation 'Derek, Here Are A Few Ideas Toward A Non-Violent Theatre' was presented in four different sections: 1. 'Derek Would Have Liked This'. 2. 'Derek Might Have Liked This'. 3. 'Derek Should Have Seen This'. 4. 'Derek Could Have Done This'. 20th September 1996 - 12th January 1997. Biennial di Firenze Art Show, Statione Leopold, Florence, Italy. A Cyberchrome and Mixed Media Construction entitled 'Where Do They Come From? Where Do They Go?' was the title of one of the pieces that David was commissioned to produce by Germano Celant of the Solomon R. Guggenheim Museum of New York. Artists included: Arman, David Bowie, Luciano Castelli, Le Corbusier and Tony Oursler. Daniel Blaise Thorens Fine Art Gallery, Aeschenvorstadt 15, CH-4051 Basle, Switzerland. Tel: 061 271 7211. Fax: 061 271 7206. 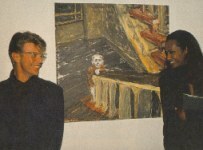 This event was David's second major art exhibition. 3rd - 16th September 1995 and 7th -10th October 1995. The 925 Gallery, Tokyo, Japan. Not an official showing but this exhibition was put together by a Japanese collector who purchased some pieces from David's Cork Street Exhibition. 17th June - 30th July 1995. Arnolfini Gallery, Bristol, Avon, England. 'Beautiful, hello, space-boy painting' was produced in collaboration with Damien Hirst. This spin painting was produced by placing a large circular canvas on a fast rotating machine and then pouring paint on to it, literally, it resembles a giant-sized version of a child's Spiromatic toy. Quote from DB: "We did some paintings together. We took a big round canvas, about 12-foot, and it's on a machine that spins it around at about 20 miles an hour, and we stand on the top of step-ladders and throw paint at it.... It's from a child's game; you drop paint on and centrifugal force pushes the stuff out." 28th September - 9th October 1994. Flowers East at London Fields, 282 Richmond Road, London E8 3NJ, England. The War Child Exhibition. The exhibition poster based on Bowie's We Saw A Minotaur: The Complete Text and Brian Eno's Arms and Legs Of The Superheroes was on sale priced at £5 along with signed copies £25 from the Atrium Bookshop. Signed sets of shrink-wrapped postcards 'David Bowie - Albion: Minotaur Series 1994' four designs in an edition of 500, featuring Horns 2, Blue & Yellow, Shoulder and Hand & Leg were also on sale. Two versions available: black label and Bo 94 in silver pen or white label with black pen 250 of each variation were available. Individual postcards also available. A set of ten postcards Bowie & Eno 94, five by Bowie (British Conflicts Series: No. 2 Art and No. 7 Military Man/Prick/Vorticist Iman/Postropolis) and five by Eno (Leon/Blocky 3/Modern Music 2/Leon 11/Cards 10). The Saatchi Gallery, 98A Boundary Road, London NW8 0RH, England. Tel: 0171 624 8299. 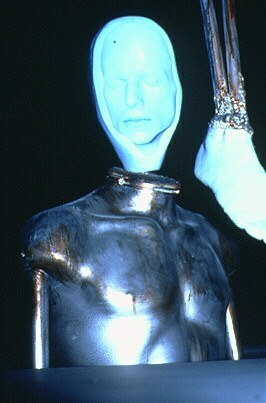 David produced 'Victim Fashion' a disciple of Ramona A. Stone based around his print VII. Melissa Hastings, a St. Martin's College design student fabricated and modelled the outfit and the shoes were made by Cecilia Vanman from Cordwainers College of Shoe Design. A pair of the outfits along with his sketch were auctioned and raised £3,500 for The War Child Charity. Brian Eno produced 'Antennae #1' for the exhibition, a 500 limited edition presentation CD box set, which was to the soundtrack for the fashion show. Inside the £100 box set was a small sample of Bowie's Ashley Wallpaper, along with artwork pieces by Damien Hirst or Patrick Hughes and a Anton Corbijn Polaroid. The Gallery, 28 Cork Street, London, W1X 1HB, England. Tel: 0171 287 8408. Fax: 0171 287 2018. This was David's first ever solo art exhibition. A Private Viewing was held on the 19th April 6-8pm by invitation. Guests included: Damien Hirst, Hanif Kureishi, Roger Taylor, Jeremy Irons, Janet Street Porter, Gary Kemp, Alan Yentob, Peter Howson, Kristina Amadeus (David's cousin), Jeremy Thomas (Producer of Merry Christmas Mr Lawrence film) and Leslie Conn (David's first manager). Memorabilia for sale at The Gallery: T-Shirt of 'Bound For Glory' £15 and T-Shirt of 'Past Present Future Accepted' £15. Memorabilia for sale at Atrium Bookshop: Exhibition Poster based on 'Afro/Pagan I' £15, signed £25 and Exhibition Brochure £15, signed £25. Two paintings were purchased by The Saatchi Gallery, and three others for important British collections. The Convention Centre at The Montreux Jazz Festival, Montreux, Switzerland. Besides exhibiting new work, David was commissioned by the committee of the Montreux Jazz Festival to design the artwork for the Festival Poster. The Berkeley Square Gallery, 23a Bruton Street, London W1X 8JJ, England. Tel: 0171 493 7939. Fax: 0171 493 7798. Other artists also exhibiting were: Michael Ayrton, Elisabeth Frink, Igor Mitoraj and Sophie Ryder. The exhibition poster based on Medieval Minotaur was on sale at the gallery priced at £5 along with signed copies £25 from the Atrium Bookshop. Signed sets of shrink-wrapped postcards 'David Bowie - Albion: Minotaur Series 1994' four designs in an edition of 500, featuring Horns 2, Blue & Yellow, Shoulder and Hand & Leg were also on sale. Two versions available: black label and Bo '94 in silver pen or white label with black pen 250 of each variation were available. Individual postcards also available. 25th - 29th April 1990. Two of David's works were exhibited: Head Of J.O. and Child In Berlin. The Twice Gifted Foundation is a charity for the American Cancer Society. Other dates also included 27th November 1990 in New York, and 30th November 1990 in Los Angeles. 23rd - 25th March 1983. David contributed several Lino Cut Prints to this exhibition. Held at Sotheby's Auction House. This idea, inspired by David, was a charity auction of 'Lipograms' produced by celebrities including Bette Davis, Jack Nicholson, Audrey Hepburn, Peter Ustinov and many others. The inscription reads: 'The lips part like silence set for alarm - Bo '79'. This was sent to Charles Of The Ritz as a thank-you for sending David a selection of make-up, this then inspired the 'Save The Children' Charity Auction. Exhibition: Le Monde de l'Art, Paris, France. BMG Entertainment International sponsored the David Bowie 'Outside' International Art Competition. Eleven pieces of art from the winners of the various participating territories were exhibited at the gallery in Paris. Art student Joseph Lee Alviar, from the Philippines was elected winner by a final judging panel made up of David Bowie, Hermann Nitsch and Christoph Ruecker. The winning entry, a 20" x 30" colour painting entitled "Destruction Of Man" was chosen based on its formal integrity, pictorial intensity, and of course, on the connection with the contents of Bowie's album "Outside." Alviar: "The art piece represents the gore of the album's contents, death and the destruction of man. The crime artist creeps into the inside of his medium, or can we say victim!? By the use of tubes and syringes he extracts life and replaces it with death. With no remorse seen in his eyes, just the excitement of seeing pain and suffering. The new generation of artists acts like gods, not because they create but they destroy." David in his presentation speech acknowledged that the works submitted "are absolutely extraordinary", and admitted that "...it was very, very hard to come to a decision, but both Hermann and I came to the same choice, which is extremely fortunate." A special mention and credit was also given to the art pieces by the winners from South Africa (Elli Garb), Japan (Yasuharu Yoshizaki) and the UK (Charlotte Baker-Wilbraham). Official press release: Young Philippine Artist Wins David Bowie "Outside" International Art Competition. The Geo Marconi Gallery, Milan, Italy. - March-June 1998 (Touring). Jacksonville Museum Of Modern Art, Florida, United States Of America. The Whitworth Art Gallery, Manchester, United Kingdom. Two rolls of David Bowie's wallpaper British Conflicts Series No. 1 - Art and The Crouch were donated by Kate Chertavian from The Cork Street Gallery, London. They are not on permanent display at present, but they can be viewed on appointment by contacting Christine Woods (Curator - Wallpapers). Whitworth Art Gallery The University Of Manchester, Oxford Road, Manchester M15 6ER, England, United Kingdom. Tel: 44 (0) 161 275 7450. Saatchi Gallery, 98A Boundary Road, London NW8 0RH, England, United Kingdom. Charles Saatchi purchased Zenzi plus another piece from the David Bowie: New Afro/Pagan And Work 1975-1995 Exhibition in Cork Street, London.